From now on, you can hide pages from the published version of your website. 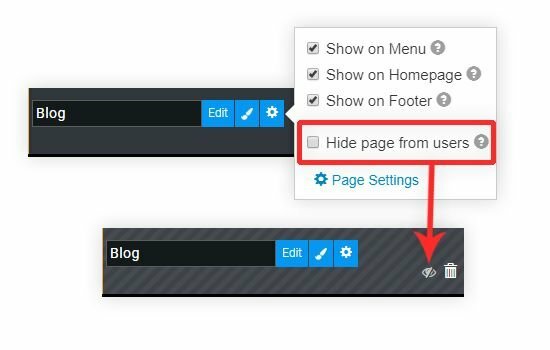 This is a great way to hide pages that you want to work on before releasing them on your live website. We’ve added 3 more layouts to choose from. These new layouts will help you gather donations and collect the money you need. We’ve added 3 more layouts to choose from. These new layouts will let you display the glowing reviews your customers have for your business or service even more effectively! We’ve added another layout to choose from. The new FAQ layout gives you more stylistic options for answering your client’s common questions. We’ve added 2 external and 1 inner layout for the services page. You can now show off your services more attractively than before! We’ve added 2 more layouts to choose from. Check it out and attract your customer’s reservations for your restaurant! We’ve added 2 more layouts to choose from. Advertise the useful features your business or product has with style and choice! Mai mult decât 1825 site-urile create SITE123 în US azi!